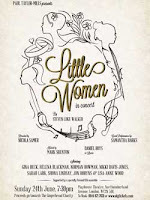 There is a concert performance of Steven Luke Walker's adaptation of the Little Women novel by Louisa-May Alcott on Sunday 24th June at 7.30pm at the Playhouse Theatre in London. The concert will be hosted by the Stage’s Mark Shenton with a fabulous West End cast of Wicked's Gina Beck (Meg): Helena Blackman (Belle Gardner): Norman Bowman (Professor Bhaer): Daniel Boys (Laurie): Nikki Davis-Jones (Jo): Sarah Lark (Beth): Shona Lindsay (Marmee): Jon Robyns (John Brooke); Lisa-Anne Wood (Amy) with a guest performance by Les Mis's Samantha Barks supported by a specially formed GSA ensemble. 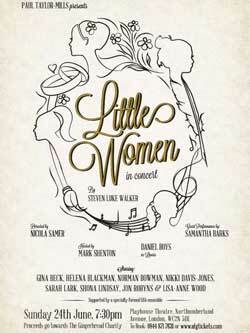 The evening will be directed by Nicola Samer with musical direction from Niall Bailey in aid of the Gingerbread Charity which provides advice and practical support for single parents.